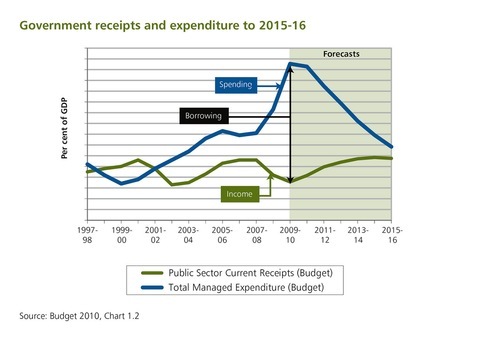 It’s a public spending slash of historic proportions as Britain launches an austerity campaign aimed at reducing its deficit. In a speech to Parliament, George Osborne, the chancellor of the Exchequer, Britain’s top finance minister, unveiled plans to cut nearly 500,000 public-sector jobs, raise the retirement age and drastically reduce welfare benefits over the next four years. The government spending review outlines cuts of 83 billion pounds ($131 billion) by 2014-15 in order TO lessen the 155 billion pound ($244.6 billion) deficit, which amounts to roughly 10 percent of its GDP. Here’s a graph, courtesy of the British Treasury’s Flickr stream. “The cuts will amount to the biggest public spending retrenchment since David Lloyd George’s program of cuts in the early 1920s,” The Guardian reported. An estimated 490,000 such jobs will be cut by 2015. The retirement age for government funded persons will be raised by one year, from 65 to 66 by 2020. This plan is considered more generous since the original spending review proposed raising the pension age by 2016. “Raising the state pension age is what many countries are now doing, and will by the end of the next Parliament save over 5 billion pounds in a year,” Osborne said. “Police budgets will be cut by 16 percent over four years, councils will face cuts of 7.1 percent a year, and the Home Office and the Ministry of Justice will see their budgets cut by 6 percent a year,” according to an overview by The Guardian. The BBC will face a 16 percent budget cut that will force a freeze on its license fee for six years. “The BBC would take over funding the BBC World Service, saving the government 340 million pounds a year,” The New York Times reported. The Foreign Office will have to cut its budget by 24 percent. On Tuesday, British Prime Minister David Cameron announced defense cuts that will eliminate at least 2.6 billion pounds ($4 billion) per year from the 37 billion pounds ($59 billion) defense budget. Cameron also announced the slashing of 7,000 army troop positions additional cuts to personnel in the air force and navy. The belt-tightening includes capital spending items as the British government is hoping to create an export-led recovery. Capital spending will be 51 billion pounds next year, then 49 billion, then 46 billion and 47 billion in 2014-15 — about 2 billion a year higher than set out in the budget, The Guardian reported. And a 4.4 billion pound package of capital funding will enable the government to build up to 150,000 new affordable homes over the next four years. The National Health Service will receive more funding — not less — under the plan to meet a Conservative election pledge, Osborne announced. And Queen Elizabeth II isn’t safe from the budget cuts either. She will be asked to pare back the budget provided by the government for her palaces and staff. The BBC has an at-a-glance chart here. And NPR asked the Wall Street Journal’s David Wessel on Wednedsay’s Morning Edition whether such cuts would ever work in the U.S. It’s unlikely, he said. 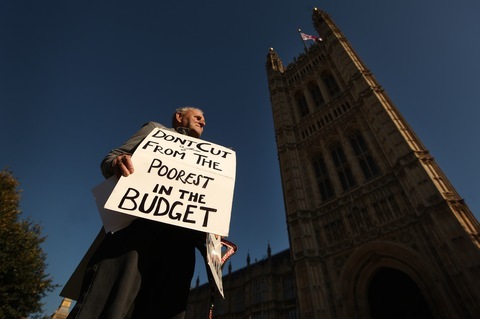 We’ll have more reaction to the UK budget story on Wednesday’s NewsHour broadcast. Stay tuned.